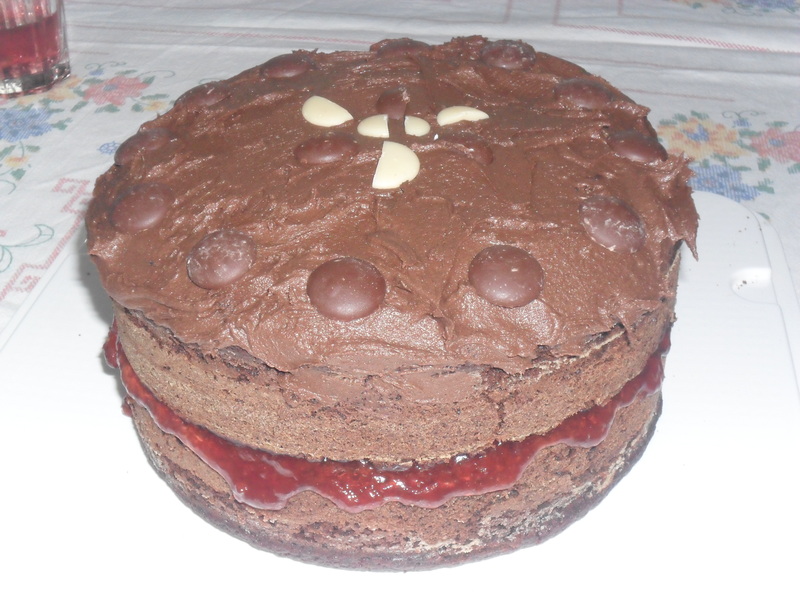 Chocolate Beetroot Cake and more of the ‘Old Fashioned Way’ …. 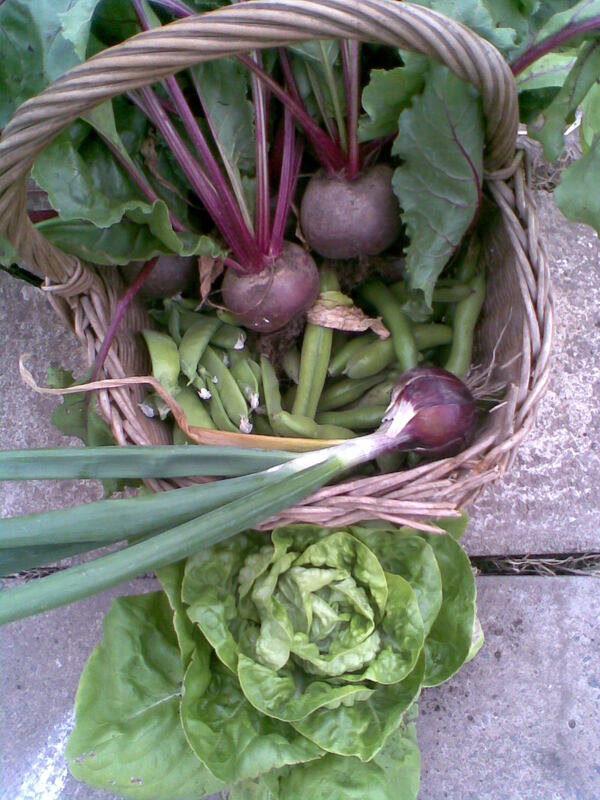 Beetroot has been around for centuries, it descended from wild sea beet. People used to eat the leaves rather than the swollen root. The root only became popular in the 18th century, when French chefs realised its potential. Nowadays most people eat just the root, though I quite often put the young leaves in our salads as they taste nice and add a bit of colour. Beetroot has loads of antioxidants and research shows it is good for regenerating immune cells and boosting the body’s natural defences in the liver. It also contains silica, which is vital for healthy skin, bones, tendons and ligaments and fingernails. So it is good to eat. The variety I grow is ‘Boltardy’, as it doesn’t run to seed so quickly when conditions aren’t so good, like this year. Beetroot is one of those things that is usually just cooked and eaten, or pickled. I try and find different ways to use my garden produce so nothing gets wasted. 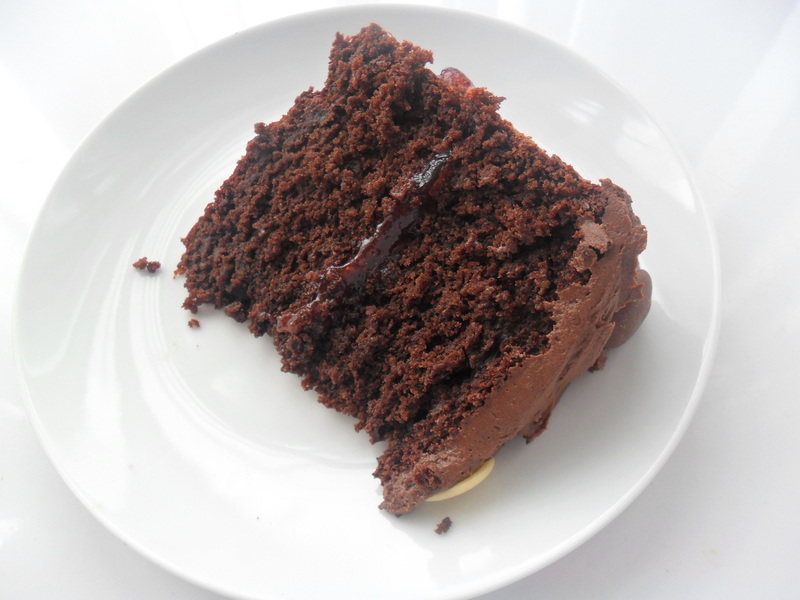 Therefore, below is a cake recipe that I make using cooked beetroot. It tastes delicious and I didn’t even admit to my family that I used cooked beetroot in it, until a few weeks ago and they were astonished as you can’t taste it. Drain the beetroot and blend in a food processor until nearly smooth, whilst adding the eggs one at a time, followed by the oil. Add the beetroot mixture to the dry ingredients and mix until just combined. Pour into the cake tin and cook for approx. 45 minutes. Take out of the cake tin and cool then top with a sprinkling of icing sugar. I doubled the above recipe today, so I could sandwich the two cakes together with jam and put butter icing on the top to make it even more special. Today I am focusing on white vinegar. White vinegar is cheap to buy and most supermarkets sell it. It can be used in a multitude of ways and is antibacterial too, so it kills most germs. It does smell when you first spray it, but the smell doesn’t linger and no one will know you have used it. White vinegar is milder than malt vinegar and dries odourless. 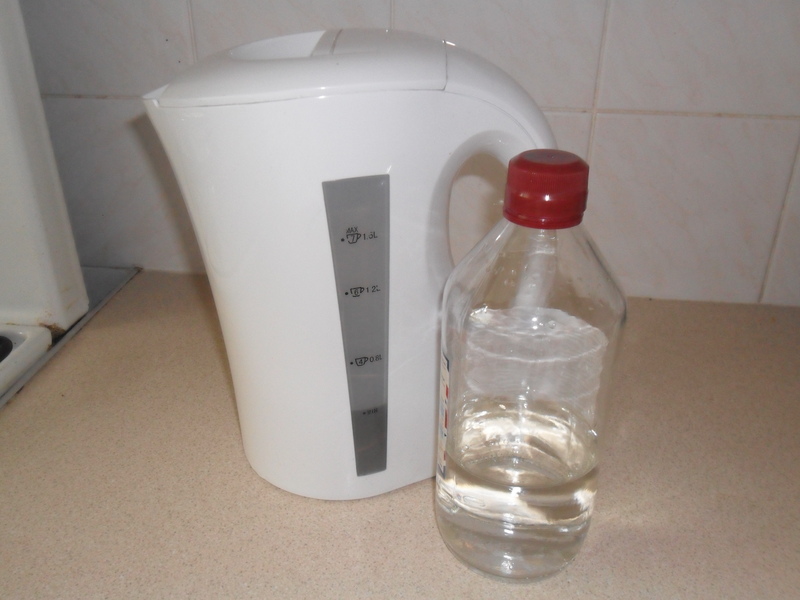 I put my white vinegar into a spray bottle so it is easier to use. Important: Don’t use vinegar and bleach together and as vinegar is acidic always be careful where you use it to clean. Test it on a small patch first and never use it on marble. 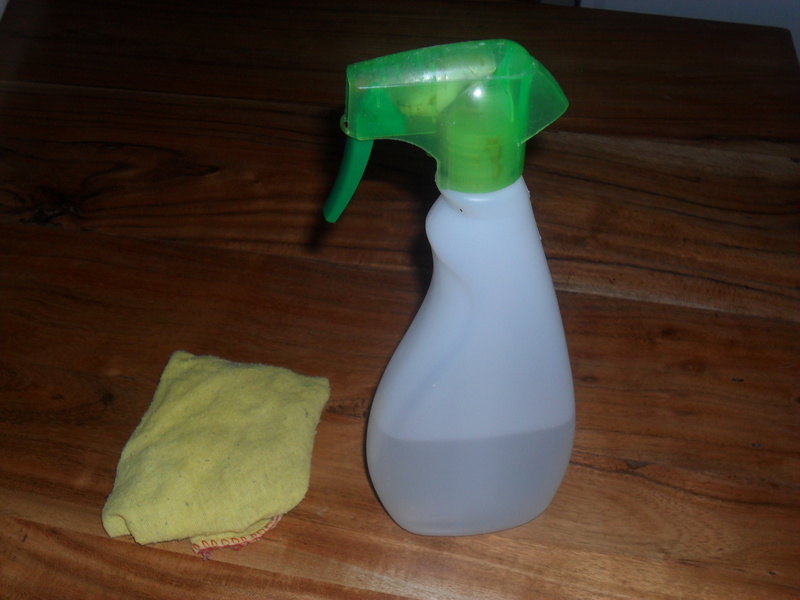 Clean your windows and mirrors with white vinegar. 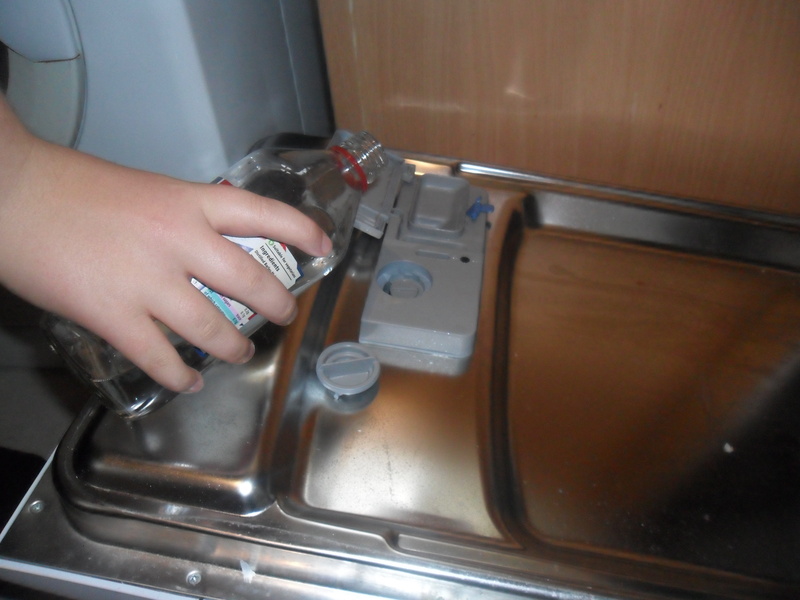 I put the vinegar in to an old spray bottle as it’s easier to use this way. Wipe it with old crumpled newspaper, it really does work and it stops the smears. I find it best to wear rubber clothes so the print doesn’t go all over your hands though. Use white vinegar as a rinse aid in your dishwasher. It makes your glasses sparkle. Use white vinegar instead of a conditioner in your washing machine. It helps stop the build-up of lime scale and makes your clothes soft and once dry there are no smells of vinegar. 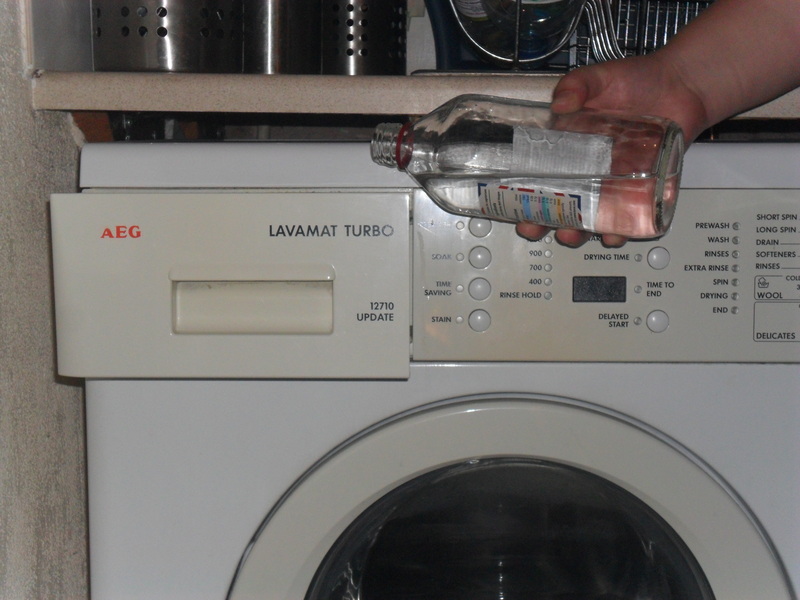 Unclog your washing machine with 1 cup of vinegar on a normal cycle (with no clothes), once a month. This is also good for cleaning your dishwasher too. 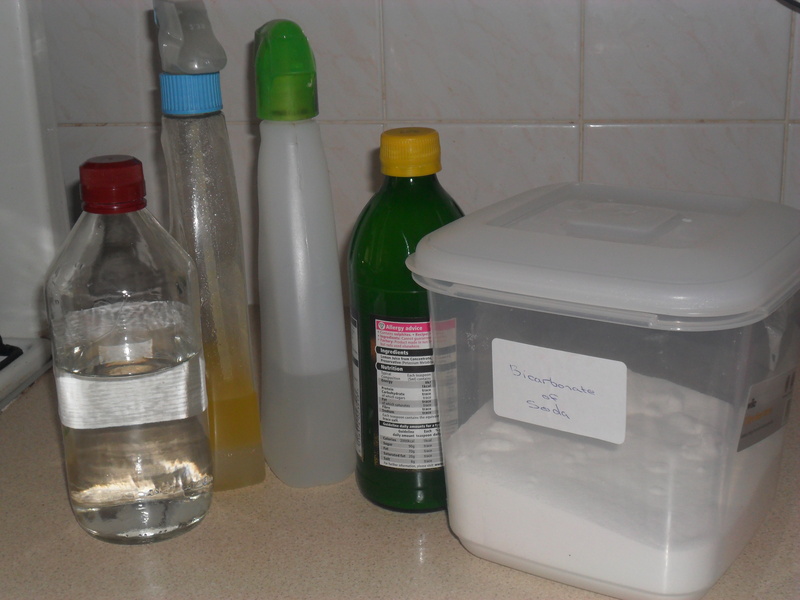 Use white vinegar to clean your kitchen and work surfaces. It is a good degreaser. Add a few drops of Tea Tree essential oil as this has anti-fungal, anti-viral and anti-bacterial properties too. If you have any spills on your cooker, spray with vinegar and leave for a few minutes and you will be amazed how easily it wipes off. Spray your stainless steel sink with vinegar and leave for a few minutes and then wipe it down with a damp cloth and it will sparkle like new. 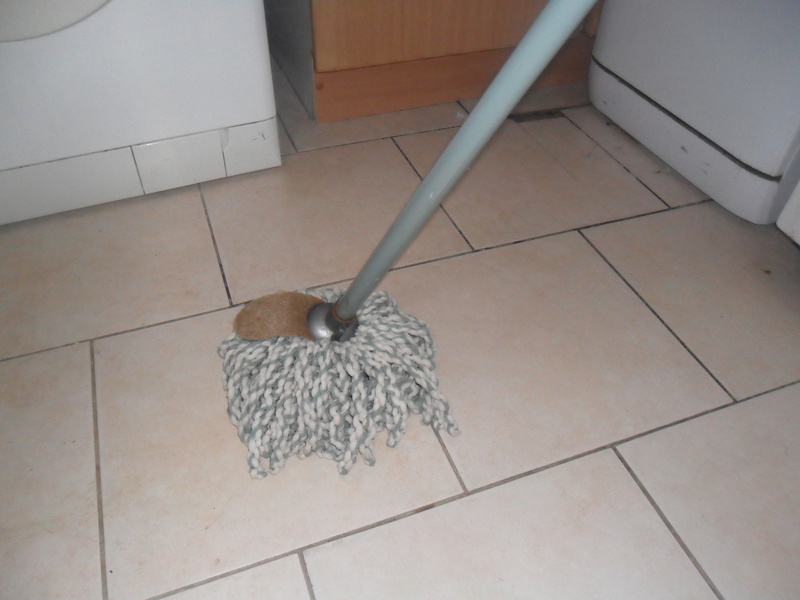 To disinfect your kitchen floor tiles, add 1 cup of vinegar to your bucket of hot water and mop. 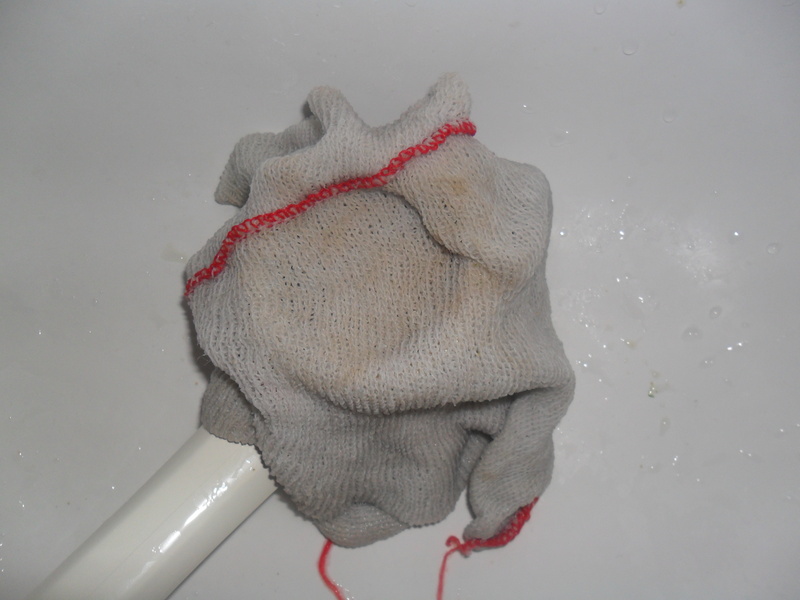 To remove lime scale from taps, wrap the taps in an old dishcloth and soak the cloth in vinegar. Leave for a while and then just rinse with water. Descale you kettle with white vinegar by mixing 1 cup of water mixed with 1 cup of vinegar and leave in the kettle for one hour. Rinse the kettle a few times afterwards. Clean your bathroom with white vinegar with a few drops of Tea Tree Oil in. A quick wipe around your sink each day will keep it shiny. 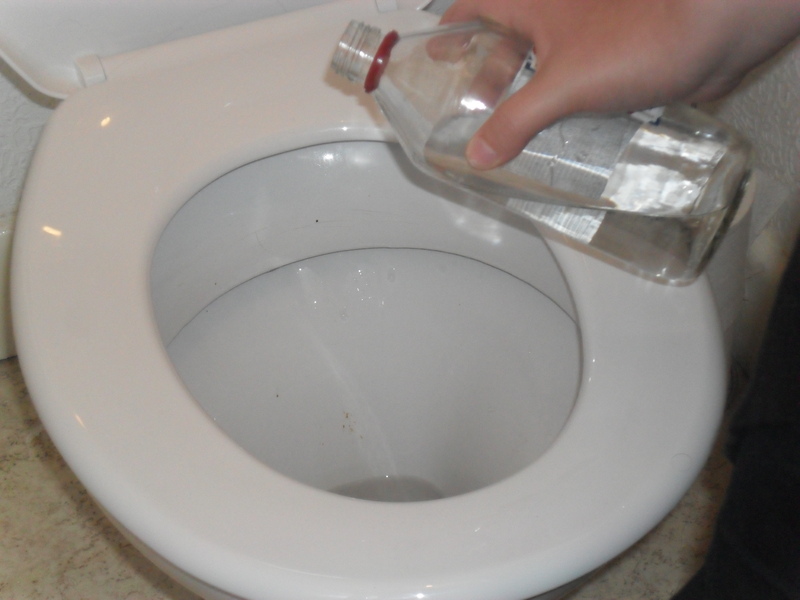 You can also use it daily to clean around your toilet seat. Vinegar will easily breakdown soap scum in your soap dishes too. Wrap an old cloth around a shower head and soak the cloth in white vinegar and leave for an hour or two (longer if it’s really bad). This will remove the lime scale. Wipe clean with a damp cloth afterwards. Use diluted vinegar, one part water and one part vinegar, to clean tiles ( if you don’t dilute the vinegar it will eat away the grout). To remove lime scale in your toilet, pour the vinegar in the toilet at night and easily brush the lime scale away in the morning. Another way to clean your toilet is to put a sprinkling of bicarbonate of soda in, followed by a splash of vinegar before brushing. To remove price stickers and labels from jars, spray or wipe the sticker with vinegar until it is soaked and after a few moments it can be wiped away easily. I will continue tomorrow with some more ‘old fashioned cleaning tips. This week I’ve decided to write about ‘cleaning the old fashion way’. I am not an ‘Eco warrior’ that ties myself to trees and I’m not saying I don’t ever use harsh chemicals, but I do try and minimize their use as much as possible now. During the rest of the week I will be writing about the different ways that I actually use the above things to clean my home. Finally, just before I finish for the evening, I would like to mention a little shop that I have discovered in Leicester today, thanks to a good friend. The shop is called “Rosy’s” and she sells products that are Gluten free, wheat free and Dairy free. Obviously this is a big help to me as my youngest daughter is lactose intolerant. I think it’s important to support specialist shops like this as they are so few and far between and yet as I have already mentioned above, there are so many people that suffer from allergies and intolerances today. Thank you for reading my post today. Today I’m starting my new regular Saturday feature called ‘Bump the Blog’. I will pick a different blog each week, that I particularly enjoy reading and I will post a link for you to check it out, to see if it interests you too. The first blog I’m featuring is called “livingsimplyfree“. It’s about a lady called Lois, who is a 49 year old single mother of two boys and grandmother of three. She was born with Muscular Dystrophy, but says she has been very fortunate as she has travelled extensively through the United States. This week she has posted about ‘Free finds’, ‘Compromising comes hard’ and ‘How can a business adapt to changing needs’. She talks about people who have been asking for work, in return for food. It made me feel very sad for these people and lucky to be in the position that my family are in. Recession has hit the world hard. This is the end of my first week of writing my blog, as I won’t be posting on Sundays. I’d like to say that Sundays will be a day of rest but I know this will be far from the truth. How wonderful the world wide web is! I hope you have all enjoyed reading my blog this week and come back to read it regularly. 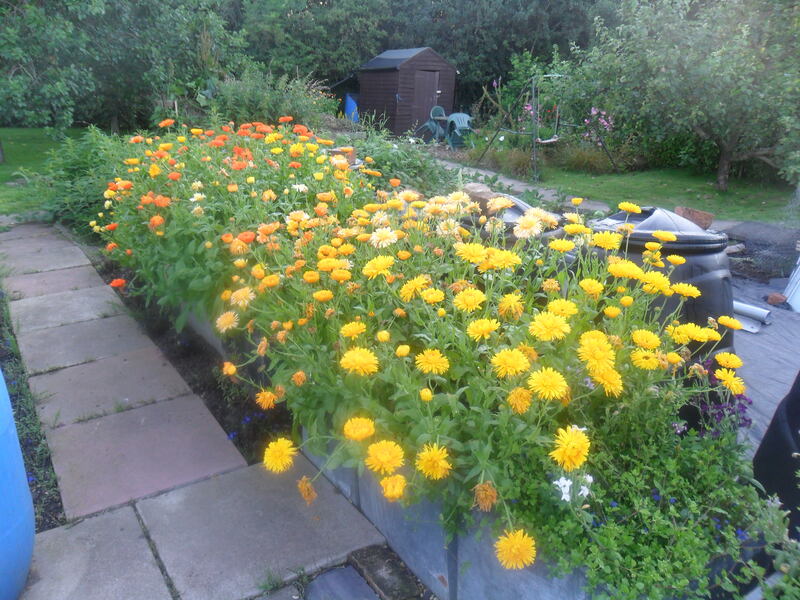 Over the weekend I am hoping to create a page on my blog about my four allotments, with photos to see how they have developed over the last eight years and what they look like now. One of the things I will be posting about next week is ‘cleaning the old fashion way‘. Not only do the ‘old’ methods of cleaning work, but they save you money, as you don’t have to buy the more expensive chemicals to clean. I hope you come back to read some more about my life. I love this saying because as you have probably realised by now, I just don’t like waste. If I can make use of something it will not only save me money, but it also helps to stop as many things as possible going into the huge landfill sites, which has got to be a good thing. (I blanch them for 1 minute and then freeze them on a tray so they don’t stick together and then bag them up when they are frozen). I am left with a large pile of pea pods which I could put into the compost bin, but I prefer to use them. They freeze well too. 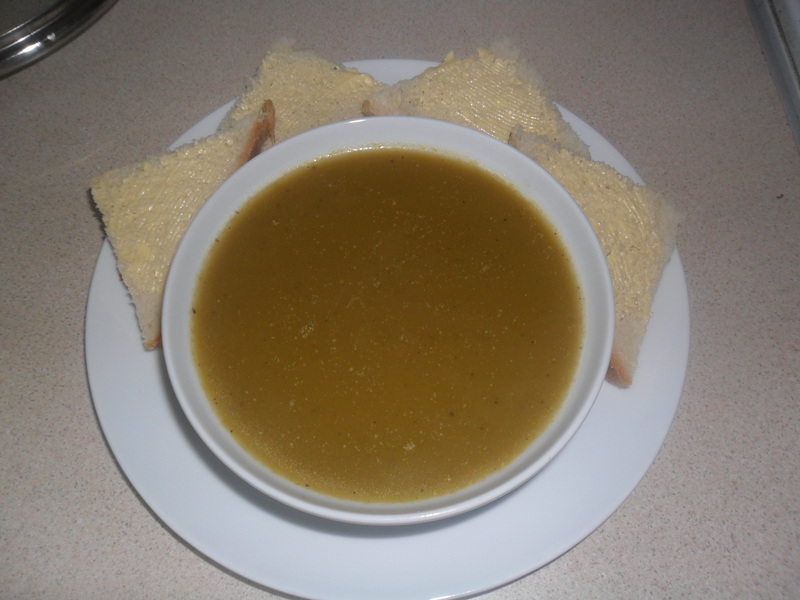 I make Pea Pod Soup. I believe it was a soup often made in wartime, when no one could afford to waste anything. My eldest daughter and I love this soup but my husband and youngest daughter don’t. It appears to be a bit like Marmite – you either love it or hate it. Don’t be put off by how it looks before you taste it, as it’s very ‘green’. 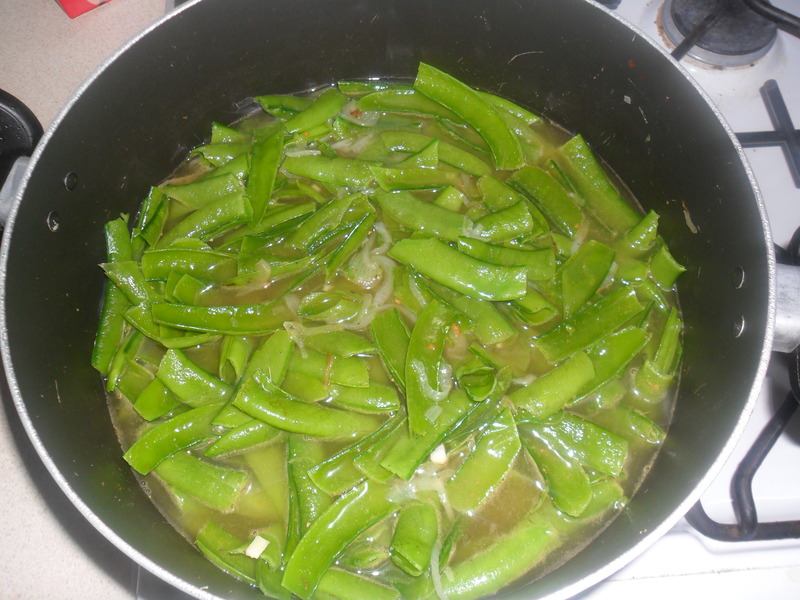 A large bowl full of pea pods with the ends removed (I use scissors for this). Strain the soup through a sieve and press the pulp with the back of a metal spoon to release as much liquid as possible. Throw away the pulp. Reheat, then add the lemon juice. Sprinkle some hundreds and thousands on it and then place it on some grease proof paper to set. I’ve had a good day today…first, my favourite magazine came through the post. It’s even better as I have the magazine subscription paid for by my Tesco Club Card points, so in effect, it’s free. 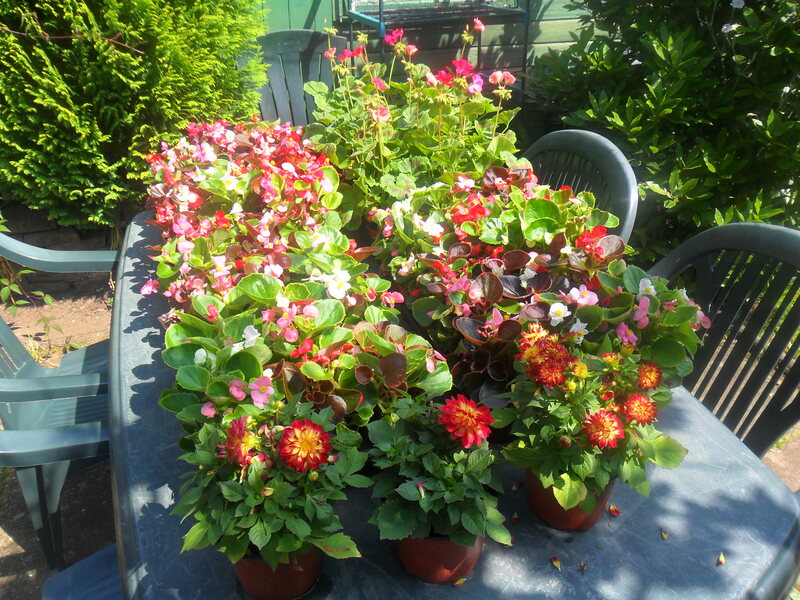 63 Bedding Plants for £9…A bargain! 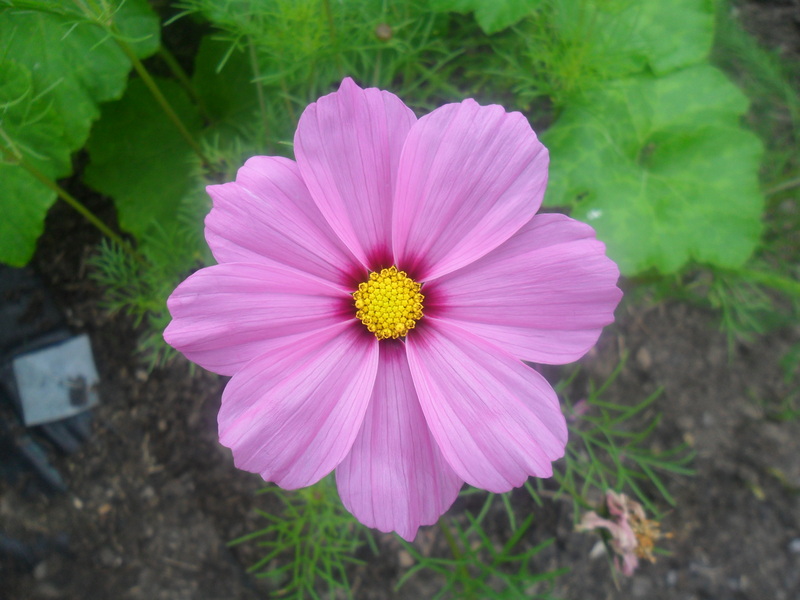 After this I went to my local plant nursery as I had been told they were selling off bedding plants cheap. I managed to get three trays of Begonia semperflorens and one tray of geraniums for £2.00 per tray and each tray had fifteen plants. 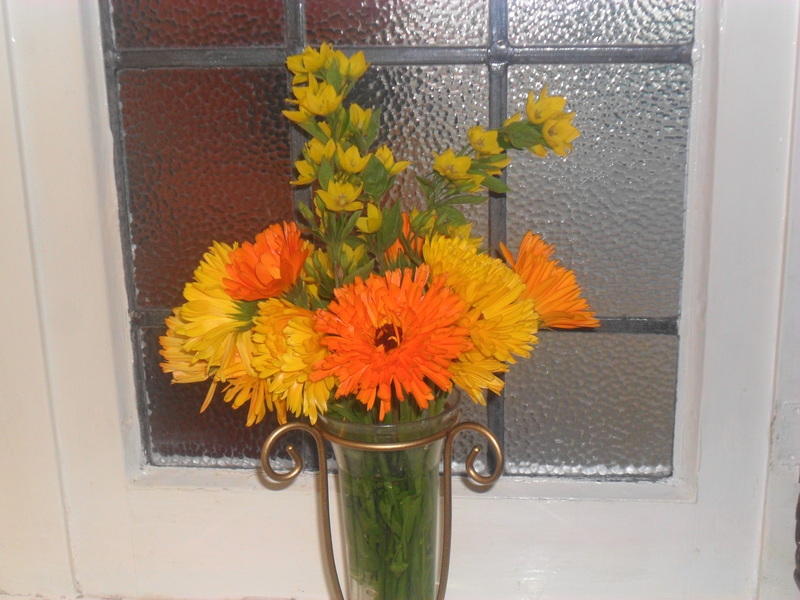 I also bought three dahlia’s for £1.00 each. This morning I weeded around my curly kale and removed any yellowing leaves. It looked really neat when I’d finished and I felt satisfied to see the finished result. 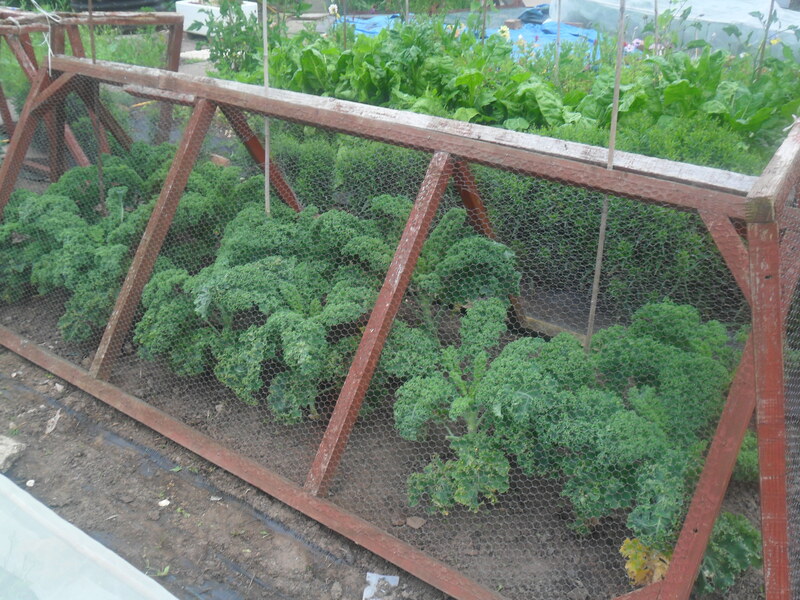 Just in case you are wondering, the birds eat everything at my allotment so the kale is enclosed in a cage to stop them. I also removed the plastic bottles that were covering my wall flowers for next spring. 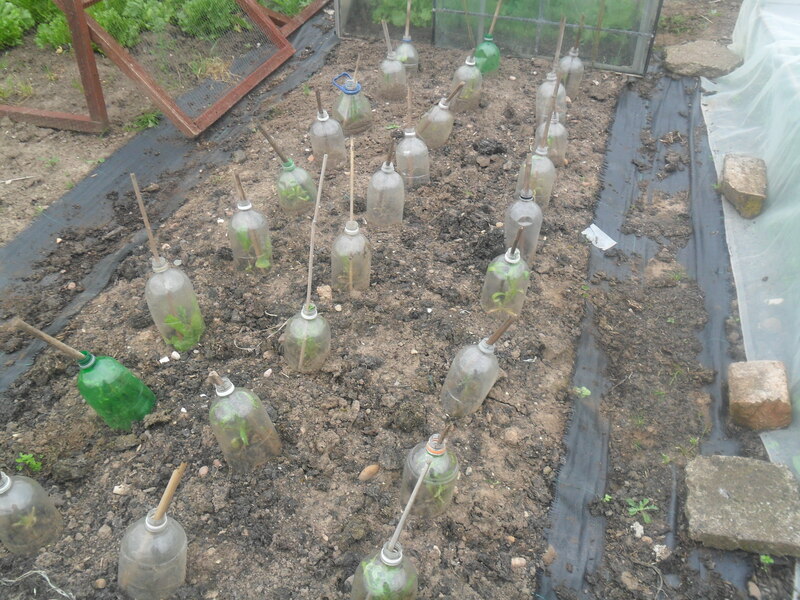 I cut old bottles in half and put them over plants to protect them from the flea beatle (as they love brassicca’s) and slugs and snails. The bottles act as mini cloches. I find if I put a stick in each bottle it stops the wind blowing the bottles away. 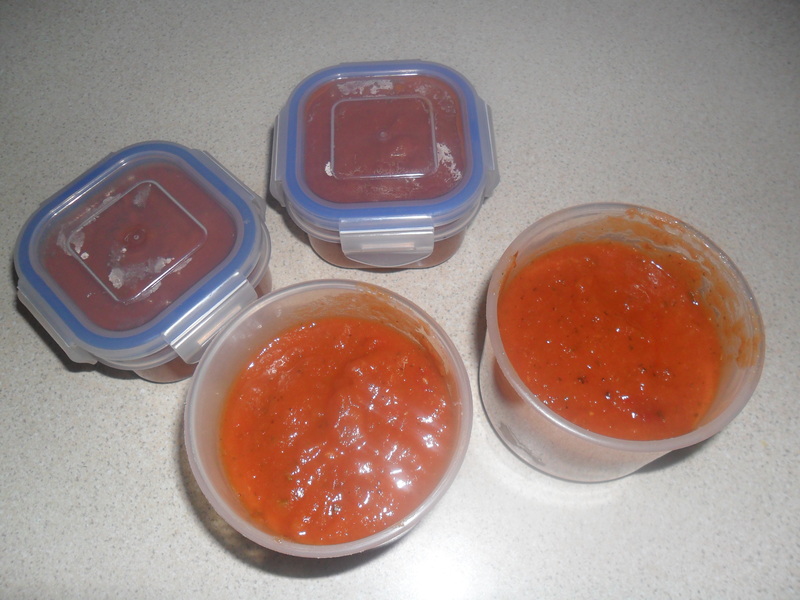 Lastly I made four portions of pizza sauce. I used one on tonights pizza and three portions have been frozen for other times. 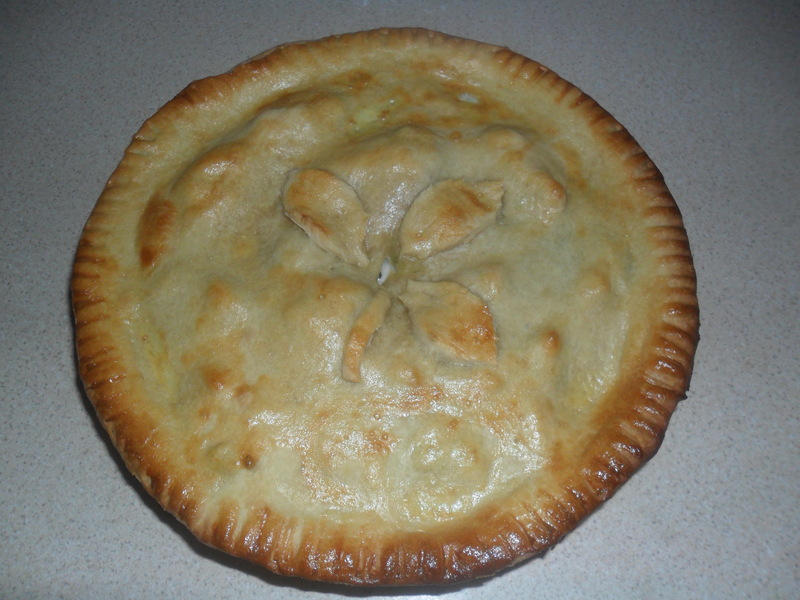 It is very easy to make and I will post the recipe another day. 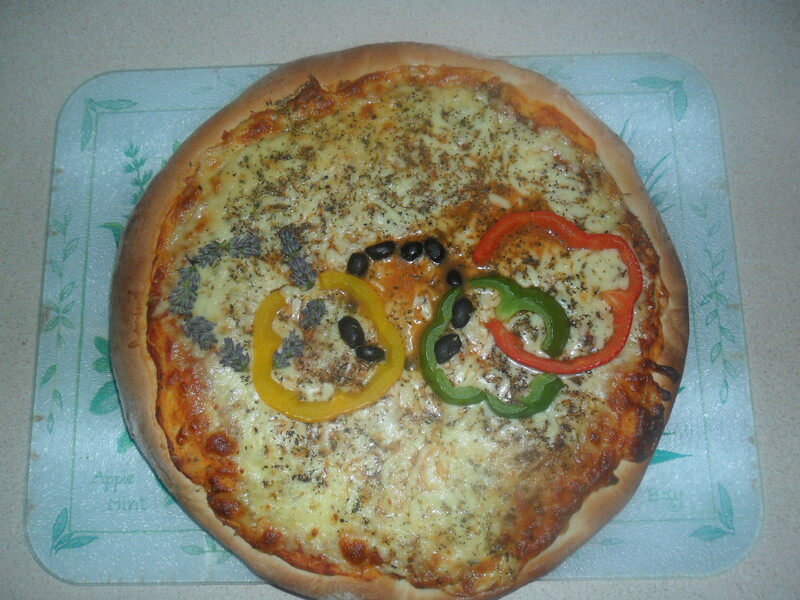 As it’s the opening olympics ceremony tonight, I have made an olympic pizza for tea. This will be served with an allotment salad and homemade potato wedges (which again are very easy and i’ll post the recipe another day). Each week I will place a link to a blog that I particularly like and find interesting, in the hope that you will like it too. Even after all these years of gardening, I still get a buzz when I see something new has grown. 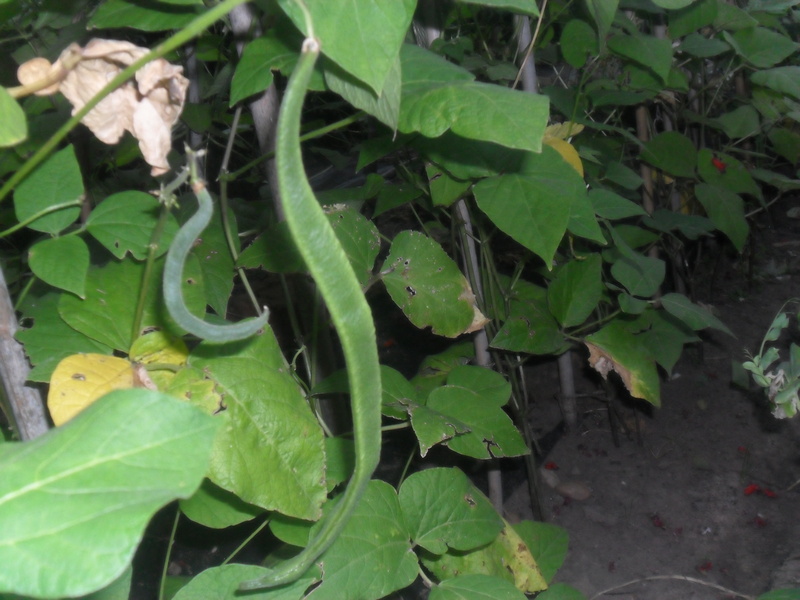 This morning I noticed by first runner bean of the year. Later I saw the first ‘late’strawberries that I planted just a few months ago. This was a joy as my normal summer strawberries have just finished fruiting. 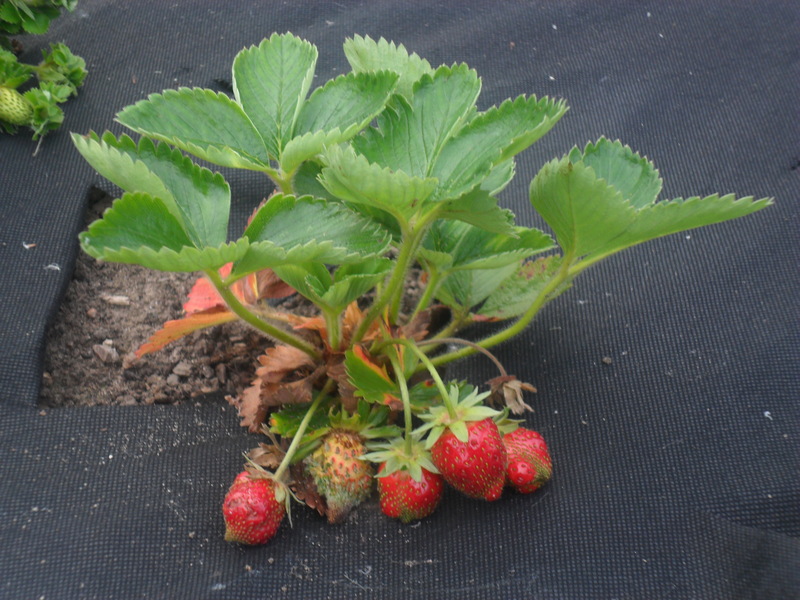 Recently I also purchased and planted some ‘early’ strawberries called ‘Marshmarvel’ in the hope of extending my strawberry season. 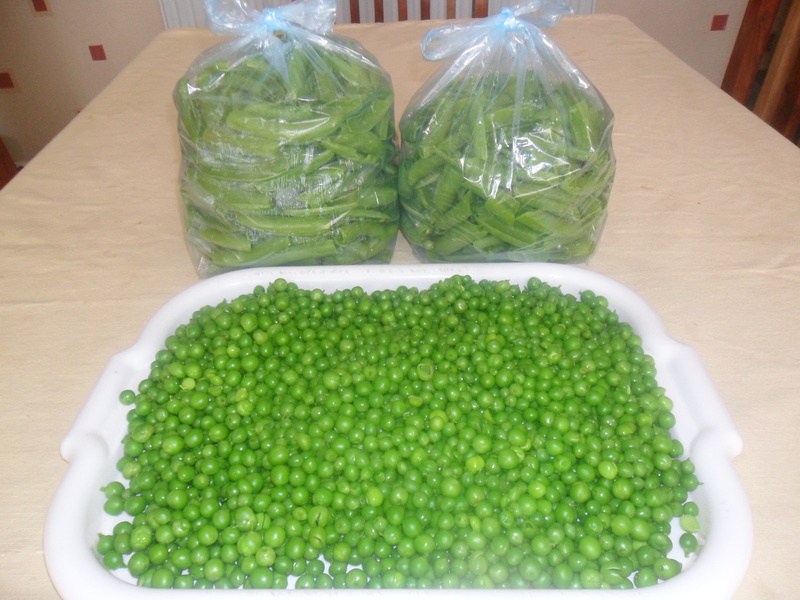 I had a good harvest today, but it did take quite some time to pick, especially all the peas. When I got home I put some raspberries on top of my cereal and they were delicious. 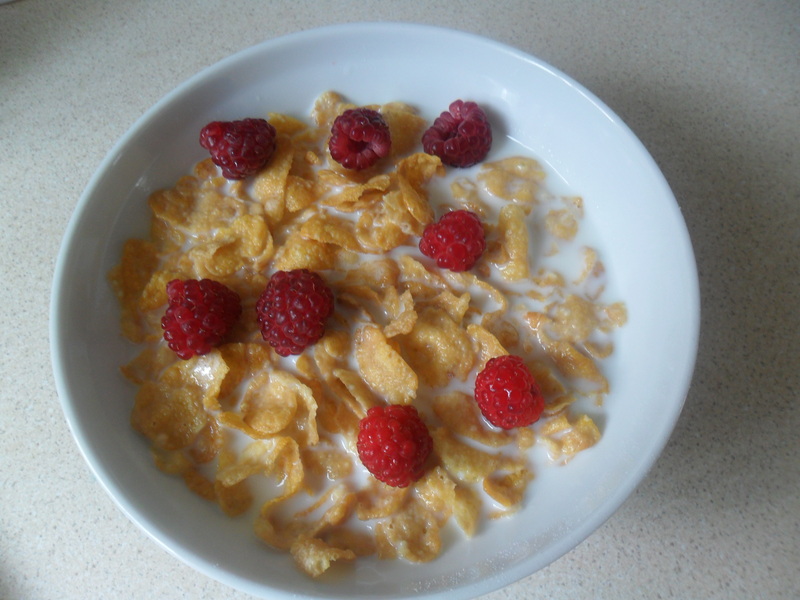 Fresh raspberries on cereal is much nicer than the dried version you buy in your cereal packets. Put the lavender flowers, flour and sugar in a blender and grind the flowers for a little bit. Seive it all into another bowl discarding the left over bits of lavender. 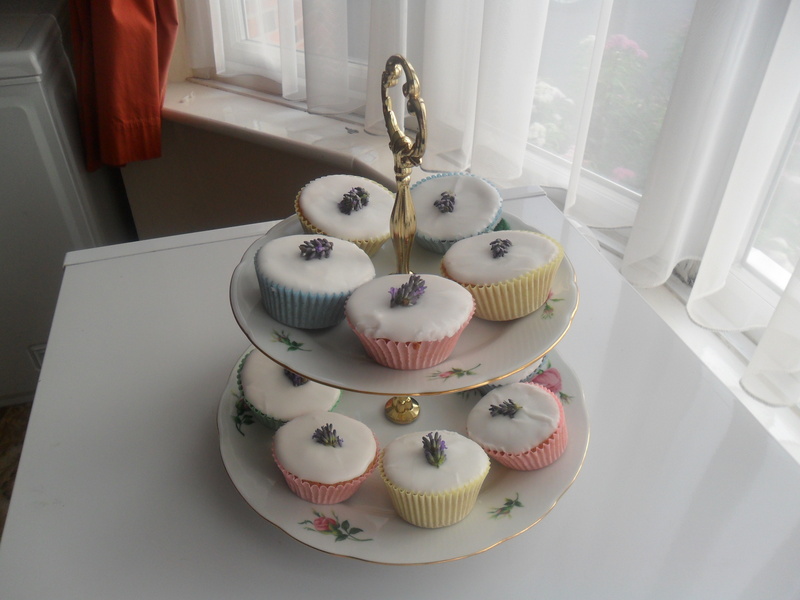 The cakes taste really nice as they don’t have an overpowering lavender taste, just a hit of it and they are a bit of a novelty if you have friends round for afternoon tea. However, I choose to take the lavender off the top of the cake before I eat it, as I find this tastes too strong for me. You may think differently, let me know if you do. I took the pastry from the freezer this morning (as I made double the amount when I last made some), so I only needed to defrost it and roll it out. I also took the cooked chicken out of the freezer to defrost. Cold cooked chicken is fine to reheat provided it has been stored correctly and is piping hot when you eat it from cooked. I fried the courgette that I picked this morning in a little olive oil and cooked the frozen spring broccoli. 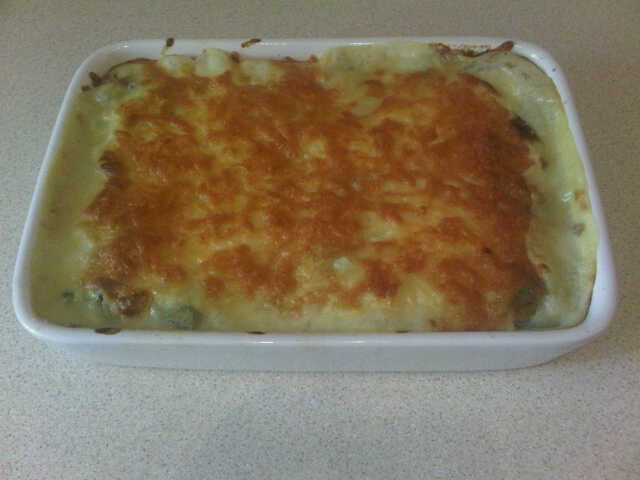 I mixed the courgette, chicken and broccoli with a white sauce and then put the pastry on top and glazed with an egg. 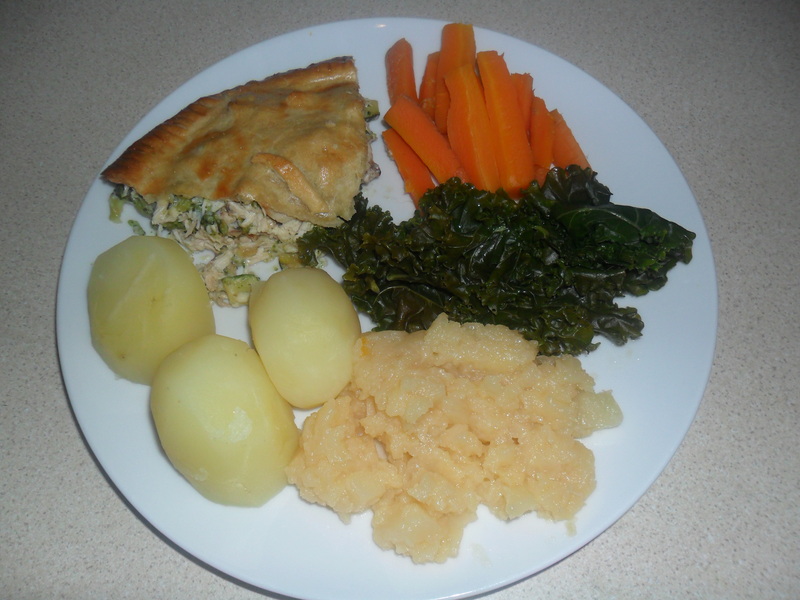 I served the pie with the potatoes, carrots and swede that I dug up this morning and used the left over curly kale that I picked from my allotment three days ago (once picked, curly kale keeps really well in your fridge). Today at the allotment I picked some borage flowers. Borage tends to self-seed everywhere so I have mine in a large pot to keep it contained. 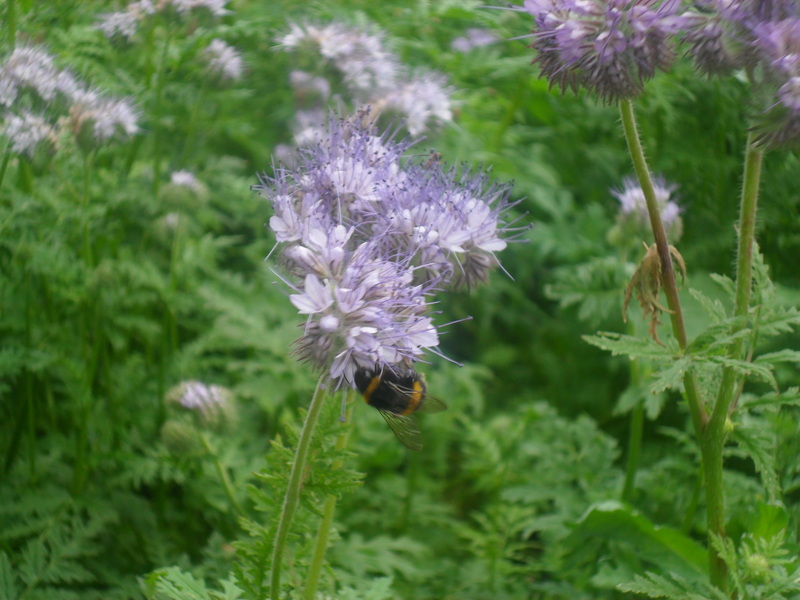 It is great for attracting pollinating bees. The flowers taste of cucumber if you eat them. 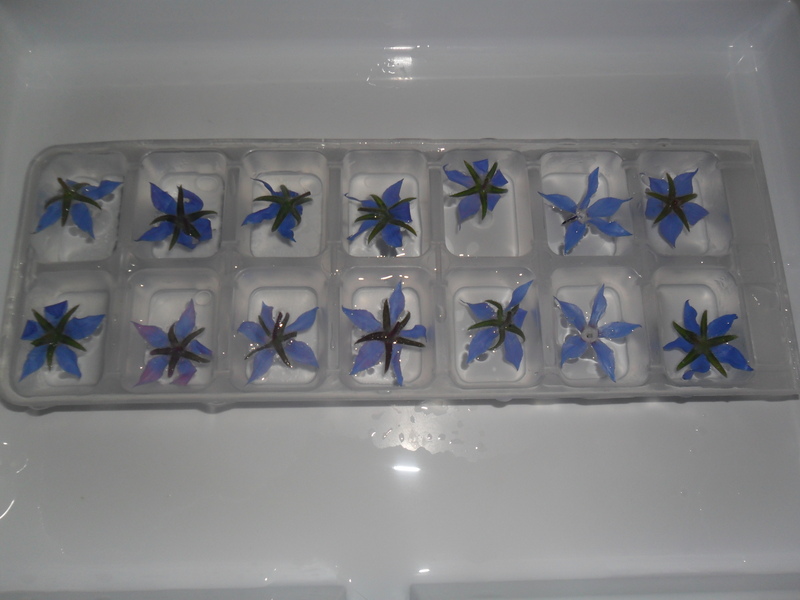 I pop the flowers in ice cube trays and freeze them. The borage ice cubes make your drinks look really pretty and they are always a good talking point when friends visit. 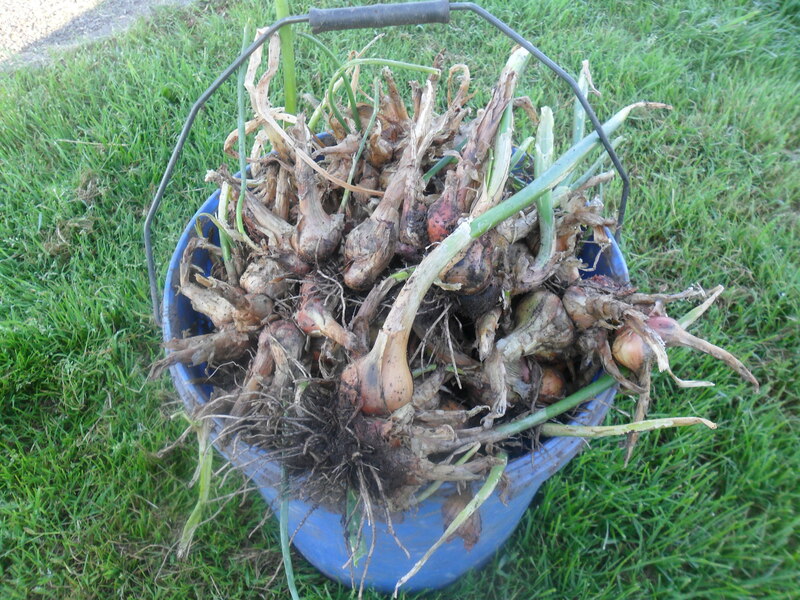 I also pulled up a bed of shallots ready for drying and pickling. I then did a bit more hoeing. I find if I hoe every bed at least once a week, then it is easy to keep the weeds down. 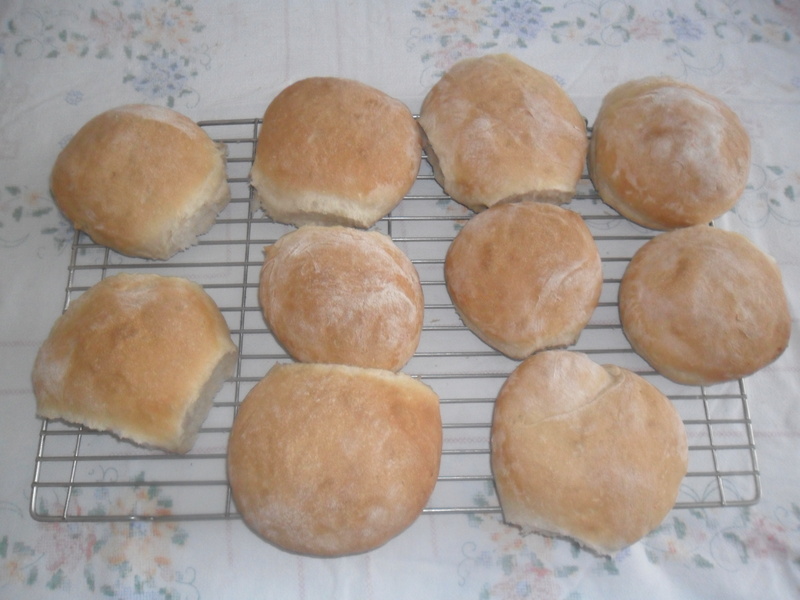 When I got home I made some rolls and a loaf of bread. I won’t pretend to be superwoman and tell you I make my bread by hand, as I don’t. I own a bread maker and I love it. 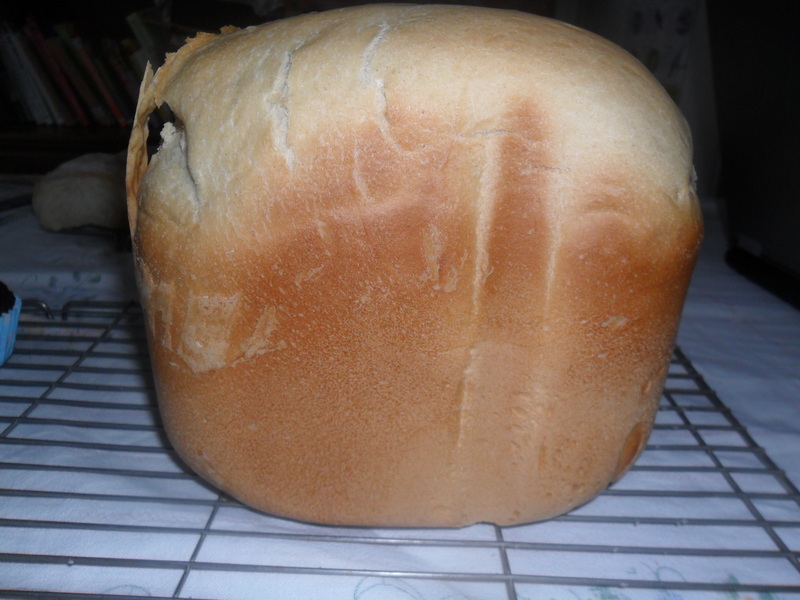 My family prefer to eat rolls for lunch so I make them by using the dough setting on my bread maker. When it’s finished, I roll them into shape by hand, let them rise and and cook them in the oven, gas mark 5 for 16 minutes. Then I weigh out the same ingredients as the rolls and let the bread maker make a gorgeous loaf from start to finish in two hours. 4 level tablespoons of Coco powder. Beat the egg with a fork and then mix into the milk. Melt the margarine and then mix it together with the egg and milk. Mix the wet ingredients into the dry ingredients but stir until only just combined, so no flour is visible. The mixture will be lumpy. This is the secret of good muffins…if you over mix they just won’t rise. Fill muffin cases three-quarters full. 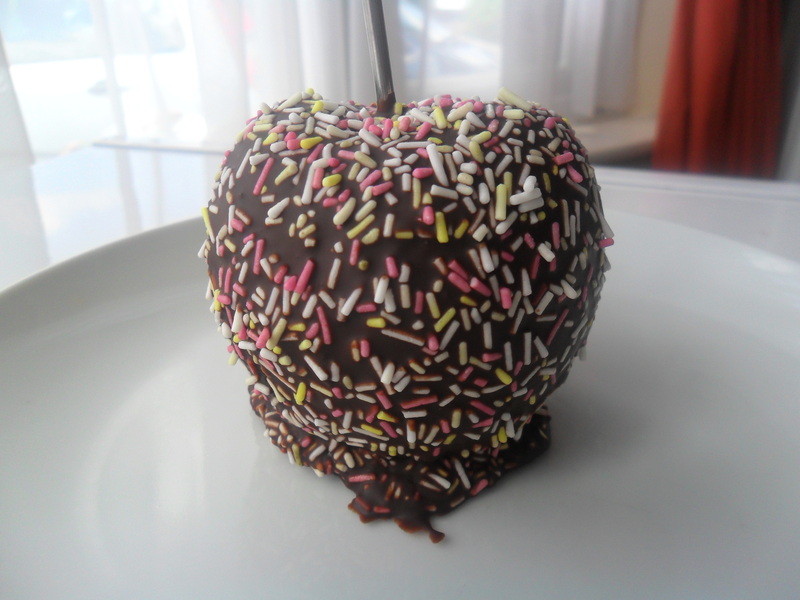 You can sprinkle with more chocolate at this stage if desired. This recipe makes approximately 12 muffins. The muffins in the recipe cost approximately 87p to make, which works out at just under 8p per muffin. The muffins I made today would have been slightly more expensive as I used ‘lactose free’ ingredients, so that my daughter could also eat them. 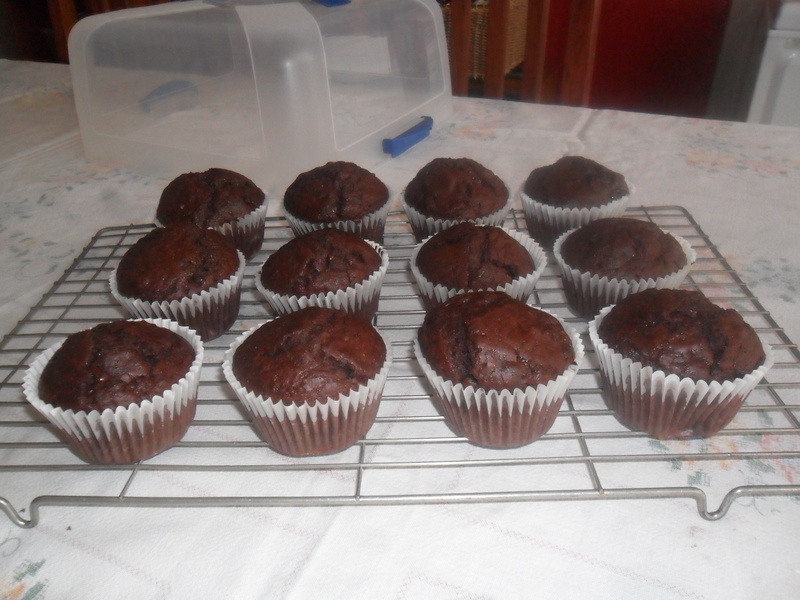 Just to give you a comparison, the cheapest chocolate muffins I have managed to find from the ‘big four’ supermarkets, were 18p per muffin and that was a half price special offer and I’m very sure that homemade ones taste an awful lot nicer. Tonight we had a ‘use it up’ vegetable curry. If we have any cooked vegetables left after dinner, I freeze them in old margarine tubs. 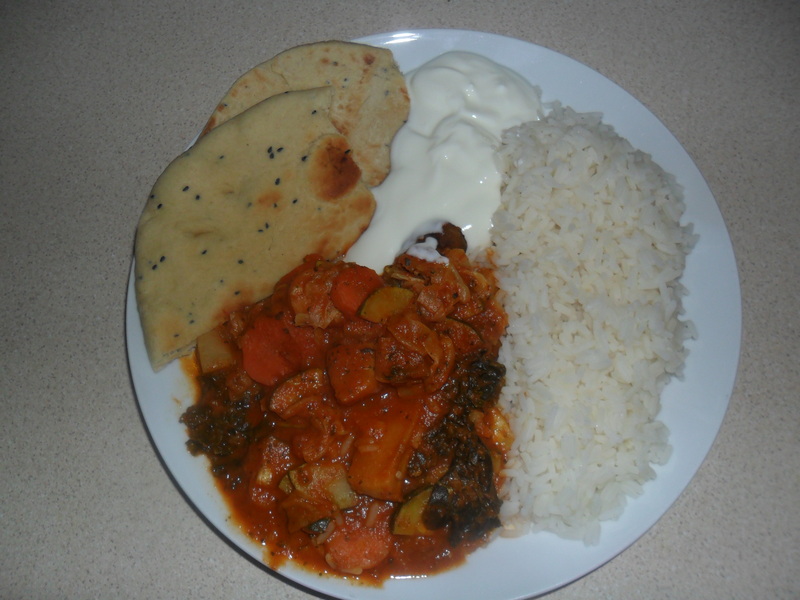 When I have enough, I make a lovely vegetable curry and tonight I served it with boiled rice, ‘reduced price’ naan bread that cost me 10p and some nice homemade yoghurt. A very frugal meal. I will post the recipe for the curry and how to make natural yoghurt, another time. It’s been another busy but enjoyable day. 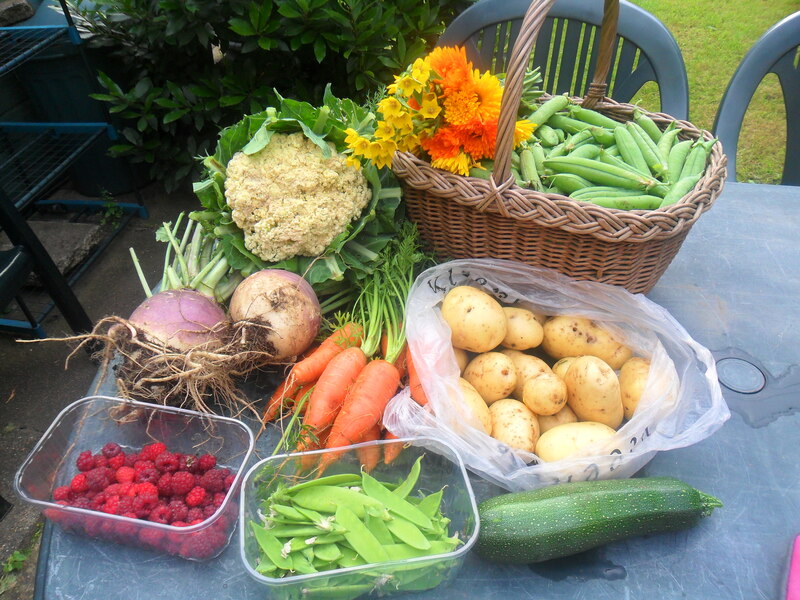 It was another beautiful, sunny morning at the allotment today. After weeks of rain and cloud, the sun is so welcoming. 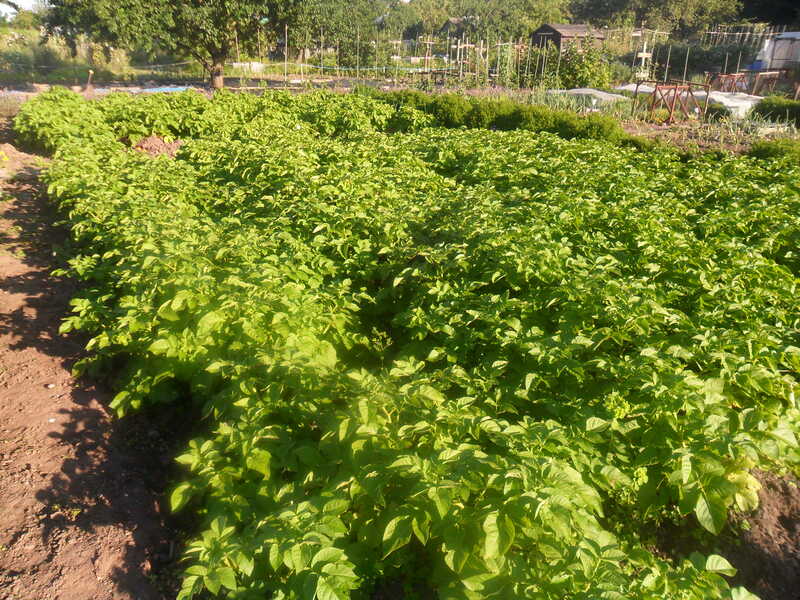 Today I weeded around my potato beds. I grow a second early called ‘Marfona’ and an early main crop called ‘Picasso’. Usually by this time of year my main crop of potatoes are large enough to dig up ready for storing…. but not this year due to the weather. I have been praying for good weather and keeping my fingers crossed that I don’t get ‘blight’ and lose the crop. Last year was a fantastic year for potatoes and our stored potatoes lasted until April, but I don’t think we will be so lucky this year. 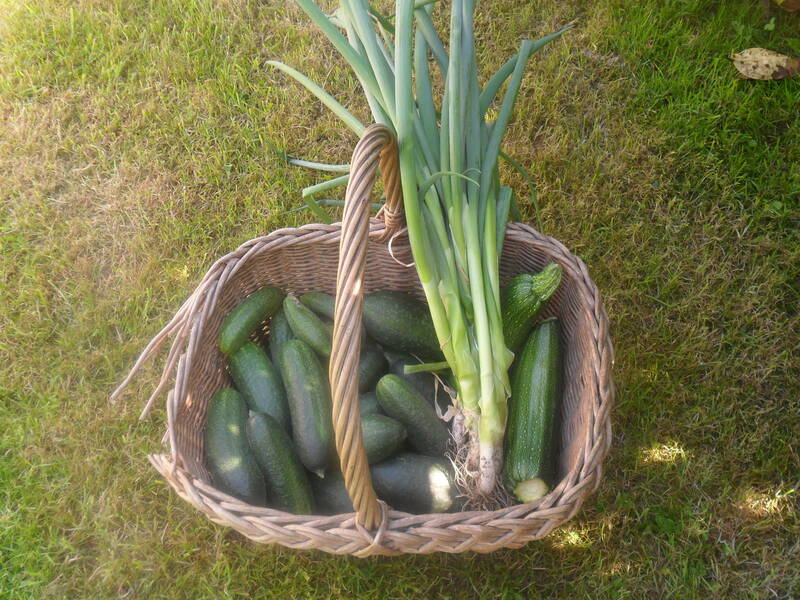 I also went into my polytunnel to harvest some gherkins. I love my polytunnel. 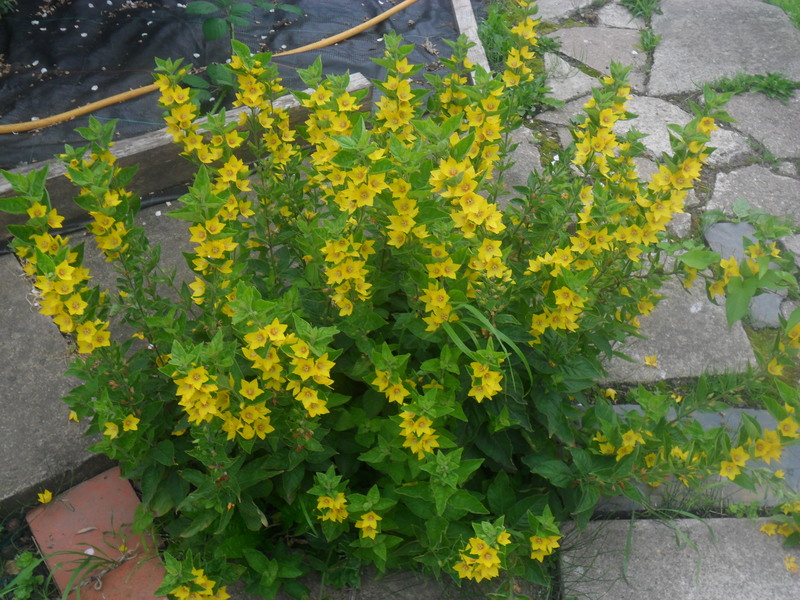 I inherited it in January when I took on plot number ‘four’. 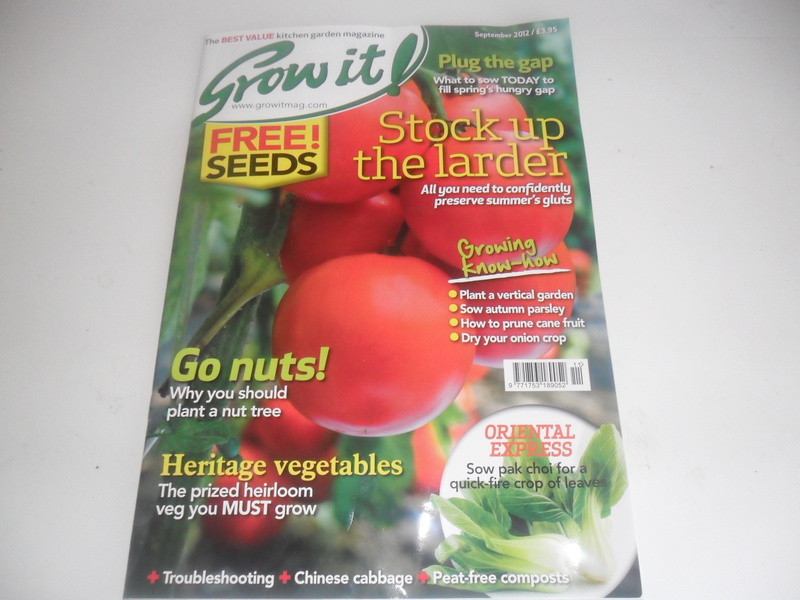 This year is a ‘test year’ to see what grows well, though I decided not to grow tomatoes as I do have my greenhouse at home with tomatoes in. 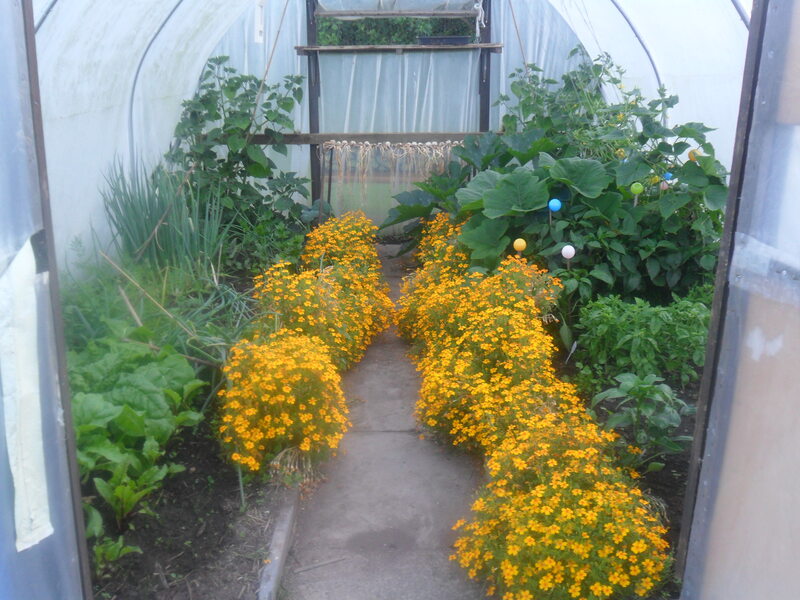 I have already found the polytunnel to be a godsend as I have had vegetables from it, when nothing is growing outside due to the unseasonable weather. I will prepare the gherkins ready for pickling later. 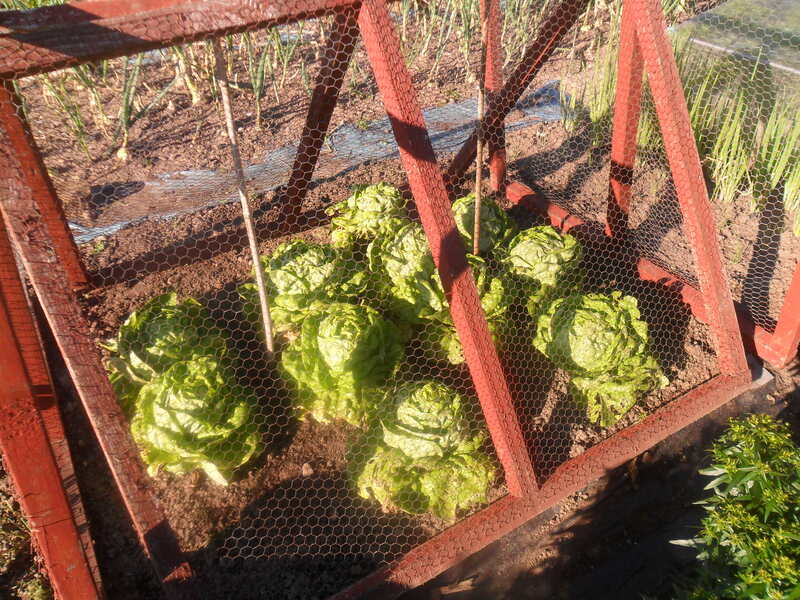 I also weeded around my lettuces and brought one home for tonight’s dinner. At 9.30am I took my youngest daughter to her hospital appointment. In October last year she was diagnosed with a lactose intolerance after her symptoms of tummy aches and periods of feeling sick gradually became worse over the last two years. We now have to keep her on a lactose free diet, which is basically a dairy free diet. This unfortunately doesn’t include her favourite food, which is chocolate, except the dairy free version which isn’t as nice. 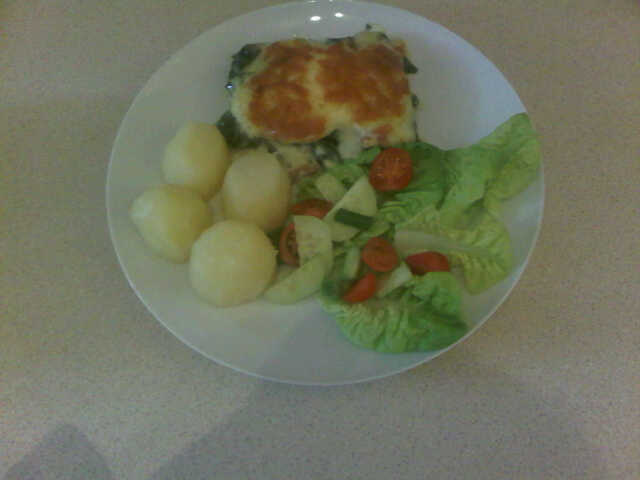 I have found that by using lactose free dairy milk and cheese and a dairy free margarine, I can make most things for her at home. It has really been a steep learning curve for us all over the last year and it was a real eye opener when I first read food labels and realised what ingredients food actually contain. It has reaffirmed my belief in baking/cooking from scratch. Anyway, I’m pleased to say the hospital discharged her today. 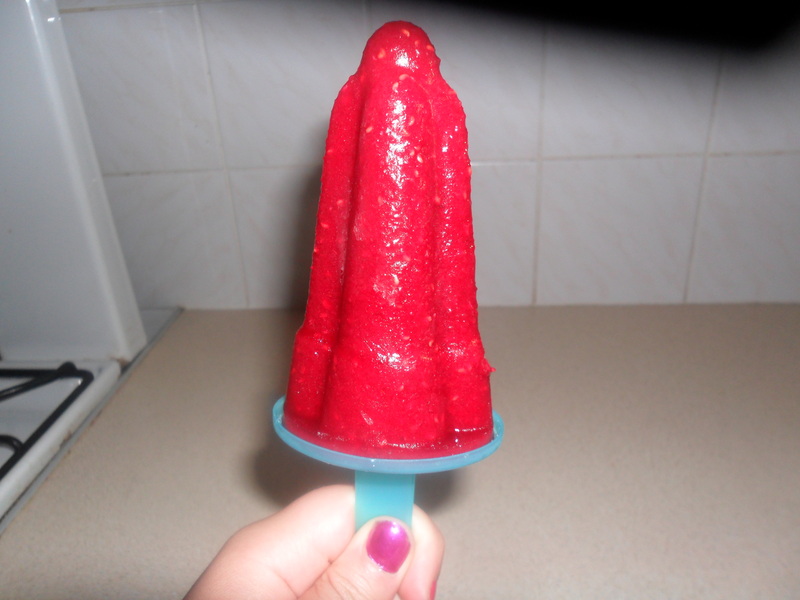 This afternoon was so hot that we decided to make some raspberry lollies from raspberries I picked from the allotment. Fruit lollies are so easy to make and taste delicious and there are loads of vitamins in the fruit, especially if you have just picked them. All you need to do is put the fruit in a blender and add a tablespoon or two of icing sugar, depending on how much fruit you have and how sweet you want the lollies to be. 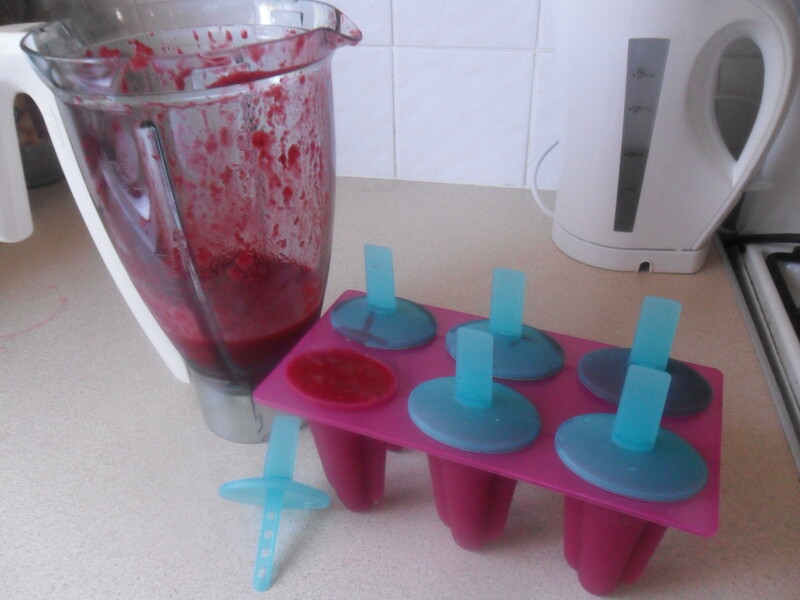 Pour or spoon the fruit into ice lolly moulds and then put them in the freezer for a minimum of four hours. They taste really nice and the kids all love them. 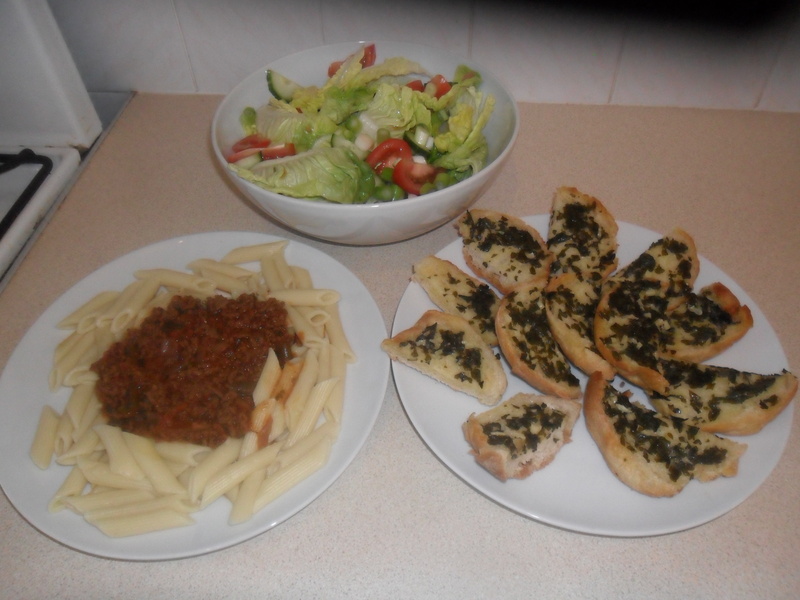 Tonight we had pasta bolognaise with lots of allotment vegetables incorporated into it, served with a home grown salad and some homemade garlic bread. Life doesn’t get much better than today.